The end of one year always brings excitement and optimism for the next. And, as 2017 came to a close, I couldn’t wait to get 2018 started. I already had big plans in the works that would immediately take effect on Jan. 1, 2018. In fact, it was the last goal I had for 2017. Now that it’s checked off the list, it is time to get to work on a new list. I’ll get to the list in just a second. An, before I do, I want you to know that some of these goals I have set for myself appear kind of silly. Like setting a goal of increasing the amount of Twitter followers. But, it isn’t about the number per say; it’s about cultivating connections and relationships. Alright, so, here goes. 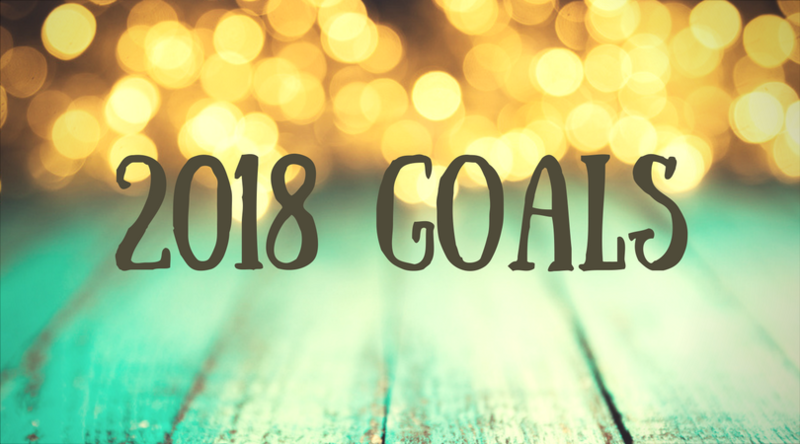 What you are about to read is my actual list of goals I have set for 2018 and with your help and encouragement, I hope to report at the end of the year I was able to check off everything and more. Now that I’ve shared mine, what are some of your goals? Can I help you turn your goals into celebrations? Are We Really That Much More Informed? We’re told that we live in the age of information. We literally have all the information of the world at our fingertips. You’re likely even reading this on your little cellular device. However, in today’s day of information, are we really that much more informed? Can we take just a second to marvel at the notion of how far we’ve come? There was a day where the only way you consumed news and information was via newspapers. Then, along came the radio. A magical little box that, at the time, transformed our world as we knew it. Finally, we had a voice to go along with the story. What next, picture? Yes. Talk about a game-changer. When the television came into play, it almost rendered the radio obsolete. No longer was it good enough to only get to hear; we needed to be able to see it for ourselves. Fast forward a few years to the present where we now hold all of that power in the palm of our hands. With just our cell phones, we can get print, sound, and video. If that’s not enough, we can even produce all three of those options with the same device. And, on top of that, we’ve added the social aspect. We can communicate with anyone in the world at any given moment of any given day. So, let me ask again, are we really all that more informed? 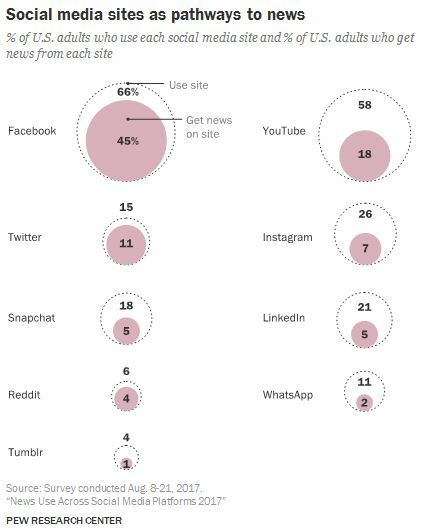 This chart shows that the two biggest social media sites, Facebook and Twitter, are among the most used sites for getting news. 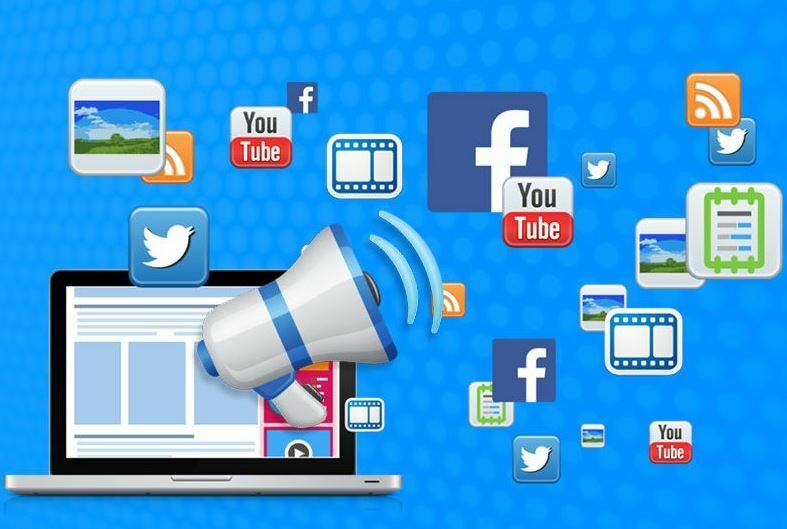 Is it not interesting that people are using social media sites to consume their news? We used to be able to only get out news from newspapers, radio/TV, and word of mouth. And, it was those traditional sources that decided what was relevant to talk about. Only the media sources had the power to decide what was important and what wasn’t. So, should it alarm you that roughly two-thirds of adults are getting news from social media and other online sources? Yes and no. Yes, because it holds those traditional media sources accountable. Think about it, because we have the ability to fact-check with a palm-sized device that we all possess, we can determine the validity of the news at that very second. But, there is a flip side to everything. As easy as it is to do that, we also have ease of access to be able to post whatever we want and label it as news. It then has the ability to spread like a wildfire simply because, well, it’s social media and if it’s on there it has to be true. This chart illustrates just what people are consuming on so-called social sites. And, in fact, a large part of what they are getting is the news. They get the news and share it. And, if enough people do in a short amount of time, it stands a chance of going viral. At that point, traditional means of news media would pick up on it and run it as news. 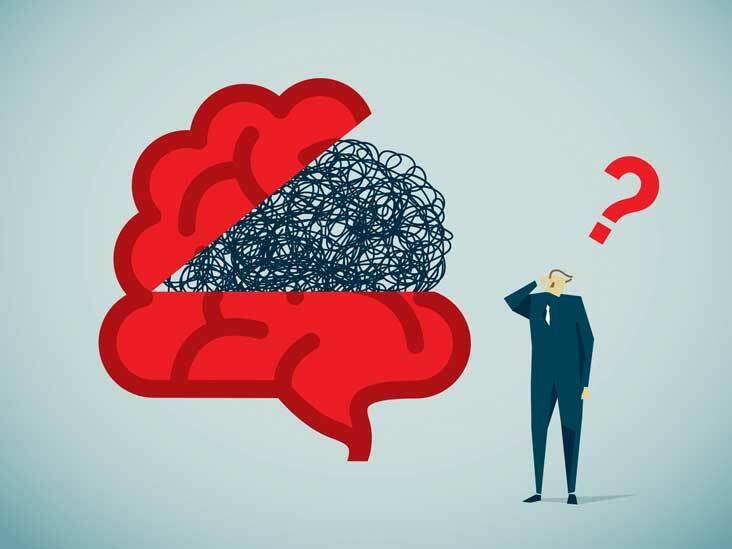 This begs us to look at our original question: Are we really all that more informed? Just because we read it or watched it on social media does not always mean it to be true or accurate. And, just because we read ir or watched it on social media doesn’t necessarily mean that we are more informed. We do live in a time where we have more access to more information at one time than at any other time. However, when you add in the speed at which ‘news’ can be shared and liked, it adds an entirely new dimension to the equation. 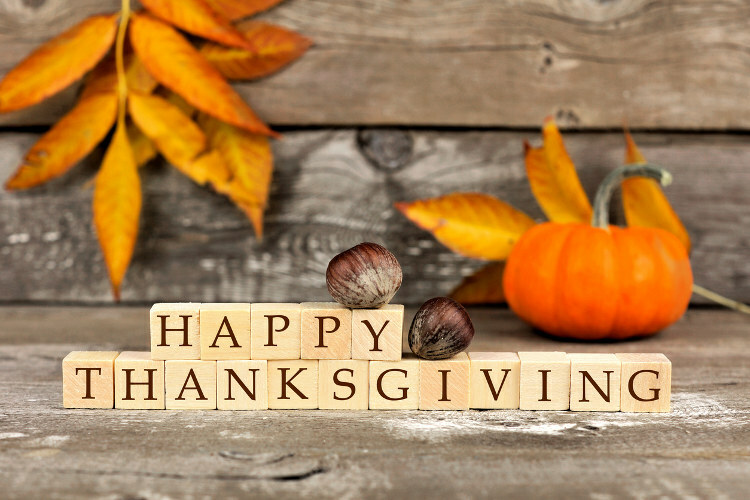 From us to you, Happy Thanksgiving! We have a very long list of things which we are thankful for, including you. And, while we know we missed naming many of you, and some of your names escaped us, we want you to know how much each of you has blessed our lives this year and just how thankful we are to each of you. Thank you and may the Lord continue to bless you and your families each and every day. Gavin Edward Stafford is FINALLY here! After many long months, we can finally say we are officially grandparents! 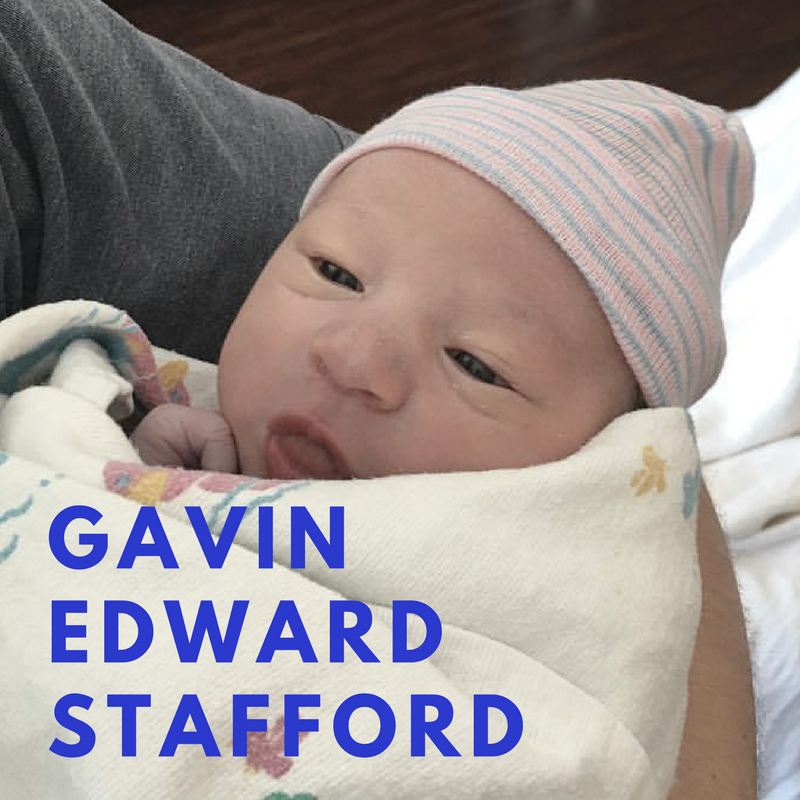 Finally, Mr. Gavin Edward Stafford is here. So, let me recap real quick like. Yeah, okay, we waited 9 long months. But, the closer this day got, the longer the days seemed to be and the longer the minutes and seconds seemed to tick by. Our daughter-in-law was admitted the night before with the expectation that they would begin inducing delivery the following morning. About an hour before the scheduled time, her water broke and she began dilating roughly 1 cm an hour. Once she got around a 6… she was at a 10 and ready to begin pushing within an hour or so. We walked into the room with seconds to spare to say we made it and to wish them good luck before the doctors and nurses shut us out. Now, it became the dreaded waiting game. It seemed like time stood still. We kept checking the clock, only to find out it had just been a few minutes since our last time check. When we made it to the end of the first hour of waiting, we realized that this might just take a while. So, we kicked back and tried to relax the best we could. Three hours later. YES! THREE. HOURS. LATER. We finally got a text message from our son saying he was here and they were getting things cleaned up so we could come in. Let me just say this: The anticipation. The excitement. The stress. The anxiety. The, all the other myriad of emotions running through our minds… when our son emerged from the corner to greet us, was one of the most amazing feelings we will never forget. It’s a pivotal moment in a person when they finally start to put all the puzzle pieces together from their life and realize and understand things from a whole new perspective. I remember at one point saying enough was enough and to take us to introduce us to his son, our grandson. The moment we got to lay eyes on Gavin for the first time was truly a gift from God! God opened the heavens for a split second and allowed us a quick glimpse. And, all we can say? WOW! Just, Amazing! I remember the first time I got to lay eyes on our son, Daniel. It broke me. I was in awe! And, when you get to set that feeling in your own child, it will have the same effect. Being able to hold your little one for the first time. Watching your child hold their child for the first time. Truly an amazing experience we’ll NEVER forget. It is just so damn cool to be a small part of an in God’s creation. I know understand more fully the scripture that says we are all made in the image of God. The following is a transcript of a talk I gave during church service. Brothers and Sisters, I am humbled to be talking to you today about setting our fears aside and simply just believing. Yeah, sure, that’s easier than it sounds. It almost reminds me of an old song called, “Don’t worry, Be happy”. 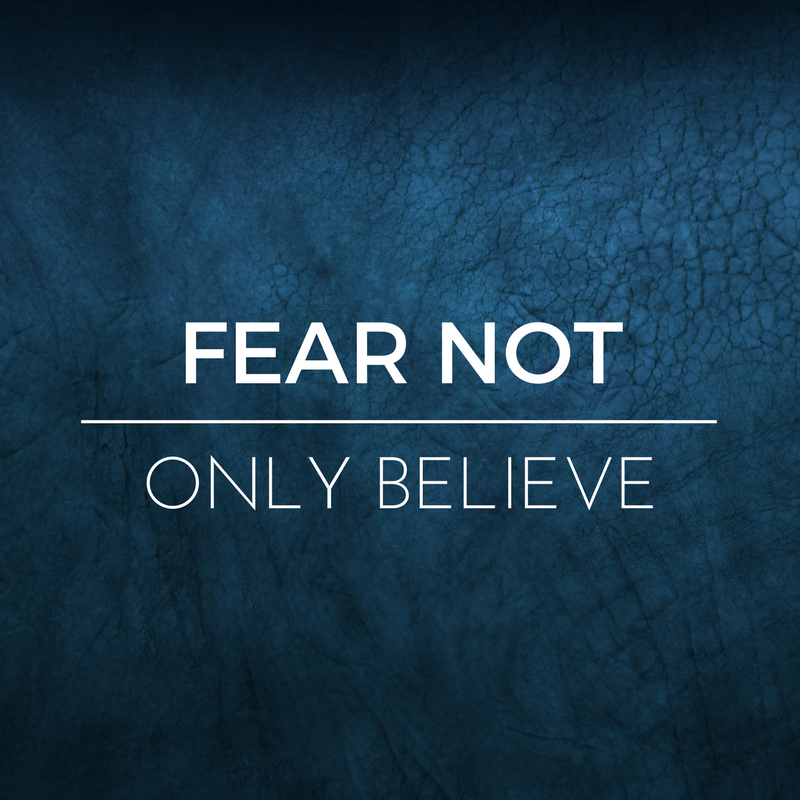 However, the message is the same: Fear Not, Only Believe. Fear. We all have fears. But, what are we doing with our fears? 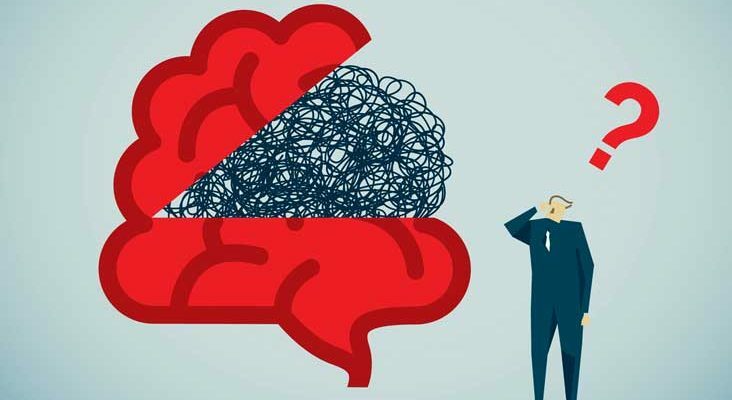 Are we being manipulated, or even motivated by them? For a long time now, fear has been used as a way to get people to do things. People in marketing do this all the time. Subaru, in a nutshell, says that if you buy their car and get into a really bad accident, you’ll live. Anti-smoking and anti-drug campaigns, “This is your brain… this is your brain on drugs.” You get the picture. Fear can sometimes get us to take action. On the flip side, we sometimes employ fear as a tool. Parents, you know what I’m talking about here. We “motivate” our kids to get their homework done, chores checked off, scriptures studied, and so on and so on. And we do it, scaring them into getting these things done out of fear that we’ll take away their most prized possessions; their cell phones, fidget spinners, and video games. There is one major problem with fear though. 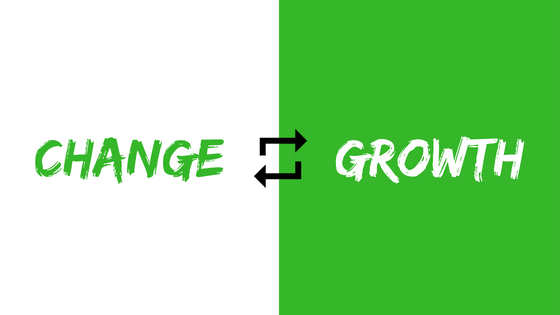 It seldom, if ever, produces real change. “It is true that fear can have a powerful influence over our actions and behavior. But that influence tends to be temporary and shallow. Fear rarely has the power to change our hearts, and it will never transform us into people who love what is right and who want to obey Heavenly Father. Let us remember, God knows the thoughts and intents of our hearts. This can be viewed as a map, if you will, that will help guide us to a better way. God is our ultimate motivator! We also need to remember something else. That is, to coin a military phrase: He’s got our 6. That should give us all the strength we ever need. In the military, when someone says they got your 6, it means they’re covering your rear sector. We can only see so much, and in the heat of the battle, much like life, we can’t always see everything that’s happening around us. So, someone will cover your blind spots per say. That’s where our Heavenly Father comes in. He’s got our back! That’s not to say he’s our tour guide. That would kind of go against how things work. He’s not to make our choices for us. If that was the case, why would he give us our agency? Think about it for a second. How many times have you been on vacation, and were doing some sort of activity where a tour guide was necessary? I can think of two that, as a scout leader, we needed a guide! Without one, I’m not so certain we would have made it out alive. On one instance, we went on a wild cave exploration. We had to suit up with pads and helmets to protect ourselves if we were to fall. We were even equipped with lights to help us see where we were going. Up front, ahead of us all was our tour guide. He showed us how to climb over and through things, knowing exactly which way was the safest. He gave no room for error. The second time we had a guide was when we went white water rafting through the Royal Gorge. This time, things were a little different. Yeah, we had a guide, but this time, our guide was behind us, in the back of the raft. It was by design, as he was the one who would help steer, but it was different. Rather than being out front having us follow each of his steps precisely, this guide helped aid us and point us in the right direction. If we made a mistake, they would help steer us to safety. Rather than protect us from falling like the cave guide, we were allowed room to make mistakes. Which, in turn, would give us the opportunity to learn from them and, hopefully, try not to make them again. Yes. You could say fear was being used as a little motivator in both of these situations. In the first, we were given tools that would help protect us from getting hurt and a guide that, if we followed his every move, would make sure we wouldn’t get hurt or lost. In the second, we had someone experienced with us helping to guide us and steer us through the rapids. I’m pretty sure some of the youth thought our mistakes would lead us to certain death at the time. God works much like both of these two examples. He has given us all the necessary tools so that we should not fear. Satan, well, he just loves himself some fear. He uses our fears, our anxieties, against us in order to manipulate us. He helps us dwell on, even exaggerating the evil in the world. He hasn’t given us fear, Satan has. And, I’ll say, he’s given us plenty of things and evils of the world to be fearful of. We are, therefore, to have faith and trust in God to help us overcome those fears. Remember, He’s got our 6! For me, it’s that key word in there that says “if”. It says nothing in there about crawling over and cowering in the corner out of fear. It says “if [we] walk uprightly”. I’ll take that as an order to stand tall and stand proud knowing Heavenly Father has our back. He’s proven that to us by showing how much he loves us. So much so in fact that he sent His only begotten Son. It’s His example that gives us the model to replace fear with faith. He knows us. He loves us. He knows what lies ahead in our future. He has given us all the tools and resources necessary to overcome fear and replace it with faith so that one day we may return to him once more. Brothers and Sisters, may we head to the words of Christ when he said, “Be not afraid, only believe.” (Mark 5:36) This I say in the name of Jesus Christ, amen. 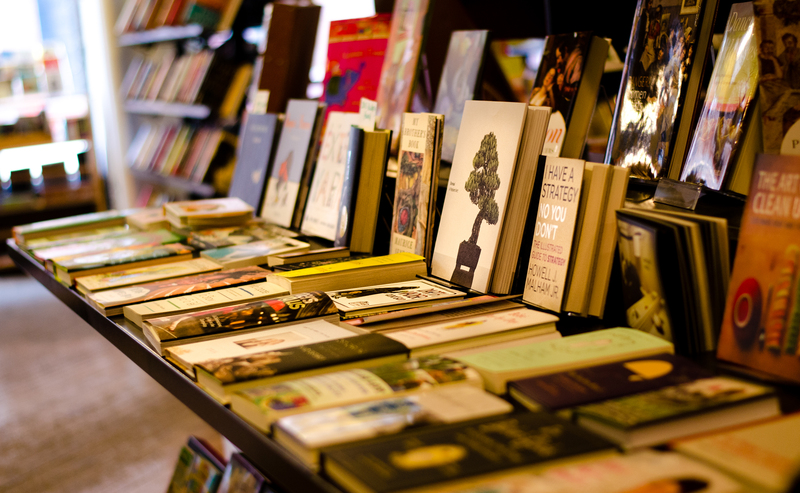 We spent our Saturday bookstore hoping. Sad, I know. But we did stuff between stops if that helps. I went for a bike ride while she stayed home and worked on picking up the house. Before and after that, yes, we went to the bookstore. No, not the same one. Two completely different types offering two completely different experiences. The first one we went to was your general run-of-the-mill bookstore. The kind you go into searching for just the right book to whisk you away into some fantasyland. Or just the right leadership book. While we’re here, we tend to find it as a place of comfort. A thinking man’s safe place if you will. The other bookstore we frequent is a Christian bookstore. I, we, never realized until now that this kind of bookstore makes us feel pretty inadequate. How could a Christian bookstore make anyone feel inadequate? When was the last time you went to one would be my response? Honestly? Picture if you will, an entire section devoted to telling you how to be a better father or mother. The father section was only a fraction of the size for the mother section. This begs a whole list of other questions to be asked. Mostly, what are we telling mothers?! You’re doing it wrong and if you buy this book or that book you can be a better mom? And the same could be said about fathers. I get it, Christ was perfect and we are imperfect. We’re full of imperfections! What about a section devoted to telling you your marriage is failing but that it can be saved if you buy a couple of books to help get you on the right path? You guessed it, there’s an entire section for that too! What message are we telling married couples? Need a book on how to pray properly? You’ll find it. Need one on gospel cooking? Yep, it’s there too. Needless to say, once we realized our thought process while perusing the racks, we realized just how comical it was. By the time we were ready to leave, we were laughing at many of the titles. We were even asking one another if we needed this one or that one. Side note: As I was writing this, I realized that Christian bookstores are the equivalent of WebMD. If you think you have a problem then you could have this or that or even this and that! And, yes, we’ll still continue to go because there are some good reads to be found. Admittedly, we’ve had a lot of rain over the last few days here in the Kansas City area. And, to be honest, I didn’t think I’d be able to get in a ride at all this weekend. So, when I checked the trail status and it said WYCO was a go, I loaded up the bike and gear and headed out. My goal was simple. Just make it out alive. LOL! Seriously though, I just wanted to have some fun and unwind for a few. He was talking about the need of having balance in life. And, as always, this got me thinking. Riding a bike takes a great deal of balance. Something I have yet to master! Okay… side note before I forget. I had already passed the halfway point of the ride, so I packed up some of my gear, downed a bit of strawberry lemonade, and was in the process of making my way back to where I had started. The trail was a bit slick from a bit of rain the night previous. The rocks and tree roots? Well, let’s just say they get greasy when your tires are wet. Okay, so I was trying to climb a little hill and my rear tire got hung up on a rock and all forward momentum had ceased to exist. At this point, everything started to move in slow motion. Heck, I couldn’t even get my feet off the pedals to catch myself. The next thing I know, as I’m making my way to the ground all the while, literally, laughing out loud, all I could think was how I had WISHED the camera was on so I could show my epic fail to everyone. All I could do was laugh! Riding a bike takes a great deal of balance. And, obviously, I still have yet to master it. Life, also, needs balance. You need to be balanced in your work, your play, your family life, and even spiritually. You need to have balance in all of these areas in your life. Will there be balance 100% of the time in 100% of these areas and more? No, not at all. It takes effort. Sure, it’s easy to give up when things get hard. Trust me, on a bike, it’s easy to stop, get off, and walk around an obstacle. But, in life, that’s not how any of this works. You’re gonna have bad days. And, you’ll certainly have good days. 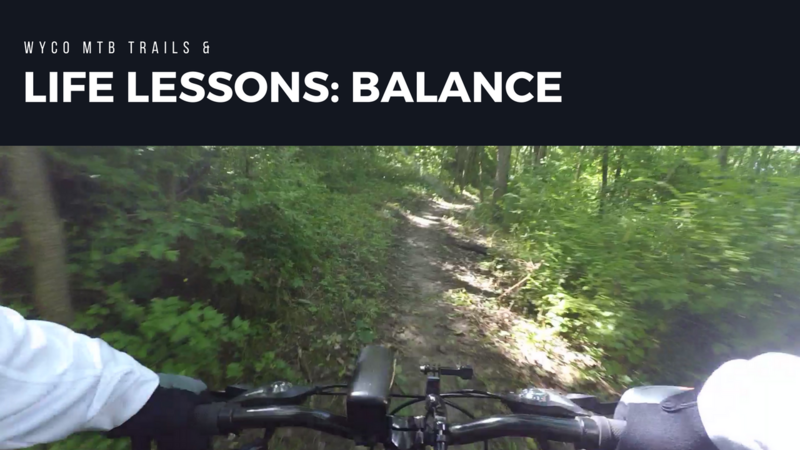 But, if you want to try and minimize the bad days, as well as some of the days in between… you’re gonna need some balance. Make the effort to find some level of balance in your life right now. It won’t take much to get started. What are you waiting for? Go find some balance!